How do I make a Solid..... Yes Solid.... Tetrahedron in Revit...? My first reaction was "just" create it in the massing or adaptive component family editor... simple right? 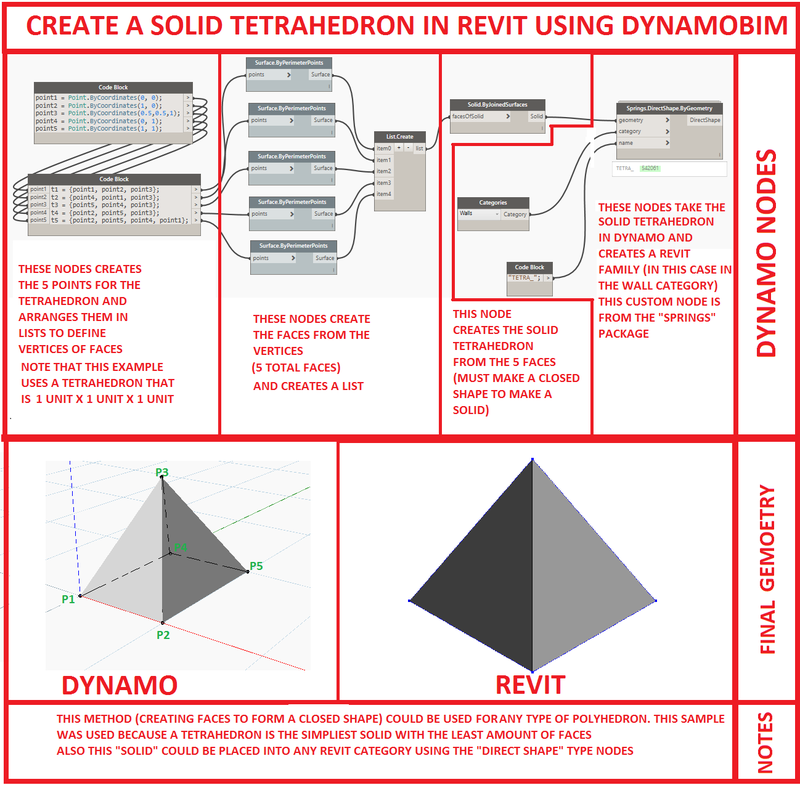 It turns out it is not possible to create a Solid Terahedron in Revit using any family editor. Why? Because a Solid Tetrahedron requires 4 triangular faces and one rectangular face. You could read more about it here. So then I thought the best way to do this is to use Dynamo and bring the Dynamo geometry back into Revit. So below is an example on how to create a simple Tetrahedron or pyramid that is 1 unit x 1 unit x 1 unit. Once you have mastered this concept you could apply this to any sided solid. Good luck polyhedron building and dont forget Dynamo is always Revit's "wingman". Although there are two ways to create a pyramid in the family editor, I learned new things in dynamo from you, as always. Um, are you having a laugh? Please correct me if I'm wrong, but I did a screencast that shows how to create such an object in native Revit. Great stuff, this blog is a gold mine, and thank you for sharing.